Today we’d like to introduce you to Joe Gilbreath. Thanks for sharing your story with us Joe. So, let’s start at the beginning and we can move on from there. 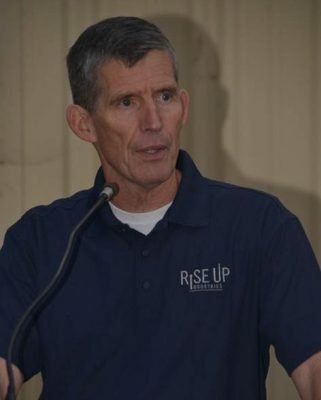 Rise Up Industries (RUI) is a non-profit founded by a few men who volunteer with Kairos International Prison Ministry. We were concerned with the apparent lack of support for inmates upon their release from prison, and the resulting high recidivism rate. We were inspired by a presentation at RJ Donovan Correction Facility (RJD) by Father Greg Boyle SJ, founder of Homeboy Industries and author of “Tattoos on the Heart”. A number of us began discussing that question. Frankly, we didn’t know what the gang situation was in San Diego or if there were already nonprofits serving this population. We decided that we needed to do some research. In our research, we discovered that at a national level, gangs are reported to be responsible for almost half of the violent crime in most jurisdictions. In San Diego, there are 158 different gangs with approximately 3,750 documented gang members. In 2017, the City of San Diego had 794 gang-related crimes including 1 homicide, 3 attempted homicides and 132 assaults with a deadly weapon. The county is negatively impacted in terms of unsafe neighborhoods, increase in drug and human trafficking, devaluation of property, gang graffiti, and increased costs in law enforcement, judicial and correctional systems. KPBS recently reported on the increased association of San Diego street gangs with the Mexican drug cartels. The most tragic impact is to our at-risk youth in our low income and underserved communities. These youth are the gang recruiting population. They are being recruited as young as ten years of age. The reported reasons these youth join gangs are: for identity, for security, and to have a place to belong. These youth are literally making life and death decisions at age ten because they believe that they don’t belong! We believe that at this age the questions that our youth should be asking themselves are: do I want to play baseball or do I want to play soccer? Do I want to play in-field or do I want to play outfield? This is America, the land of opportunity! Our youth should be able to enjoy their childhood in safe and welcoming communities. They should be able to dream of their futures and be assisted in reaching those dreams. We knew we had to do something. After months of research, we concluded that a Homeboy Industries type program was needed here in San Diego. We have modeled our program after Homeboy Industries and are a member of the Global Homeboy Network. This network meets annually at Homeboy Industries to share ideas, best practices and lessons learned. Rise Up Industries’ mission is to minimize gang involvement by providing integrated gang prevention, gang intervention and post-detention reentry services. Of our three-prong approach – gang prevention, gang intervention, and post-detention reentry services – we began with our post-detention reentry services. We opened our Reentry Program in March of 2016. Our program is 18 months in length, 40 hours per week. A key component of our Reentry Program is interim employment and job training in our social enterprise. Fulltime employment is necessary for successful reentry and departure from gang life. As Father Boyle says, “Nothing stops a bullet like a job.” Frequently, incarcerated gang members decide to leave gang life upon release from incarceration. However, successful reentry into the community requires employment, and these individuals face many barriers to obtaining employment. These barriers include criminal record, lack of education, lack of work experience and/or job skills, visible tattoos, addictions, lack of transportation, lack of job searching and job interviewing skills. Faced with these challenges, many have no choice but to revert to the life they know and return to the neighborhoods from where they came. This is a major reason that the recidivism rate is so high. A recently released study (Recidivism Among Federal Offenders: A Comprehensive Overview) by the U.S. Sentencing Commission (USSC), reports that 49.3% of inmates released in 2005 were arrested again within eight years. The interim employment in our social enterprise provides an immediate source of income as well as life skills training, work ethic development, and specific marketable job skill training. Our members are paid employees as they work their way through the program. Both the job training and the work experience prepare our members for successful long-term employment upon graduation. We just began the third year of operation of our Reentry Program. We have made significant progress in developing the various components of the program: case management, counseling, mentoring, education, community service, and interim employment and job training. Continued growth of the wraparound services is still needed and we also are planning for the expansion of our enrollment capacity because the need is high. Once our Reentry Program is fully established we will proceed with the development of our prevention and intervention programs. We believe that the combined impact of all three integrated programs will minimize street gang activity and lead to safer communities. There are always bumps in the road! Our first major bump was obtaining our 501(c)(3) status – this took us over a year to obtain! On the positive side, that delay provided us time to continue our research and plan for the opening of our reentry program. Another challenge for a start-up nonprofit, with absolutely no track record, is to obtain funding. Funding a start-up is high-risk for funders who obviously would like to have some assurance that their “investment” will be used prudently and have an impact. Additionally, our population of ex-offenders with gang-related tattoos does not compete well against cancer victims, wounded veterans etc for donation dollars. Also, many grantors are interested in knowing their return on investment and want to know how many people have been served. Our 18-month program does not compete well in terms of numbers served with programs that are 3 or 6 months in length. Nevertheless, we have been blessed with donors and grantors with their votes of confidence in funding us with virtually no track record. I am happy to report that last November our first graduate was immediately employed upon graduation with a local high precision manufacturing company. They are very pleased with their hire and are looking to hire future graduates. Our next member will graduate in November. Rise Up Industries – what should we know? What do you guys do best? What sets you apart from the competition? RUI’s Machine Shop Social Enterprise is a key component of our Reentry Program. Here we train our members to be a Computer Numerical Control (CNC) machine operators. This is a well-paying trade that is in high demand. 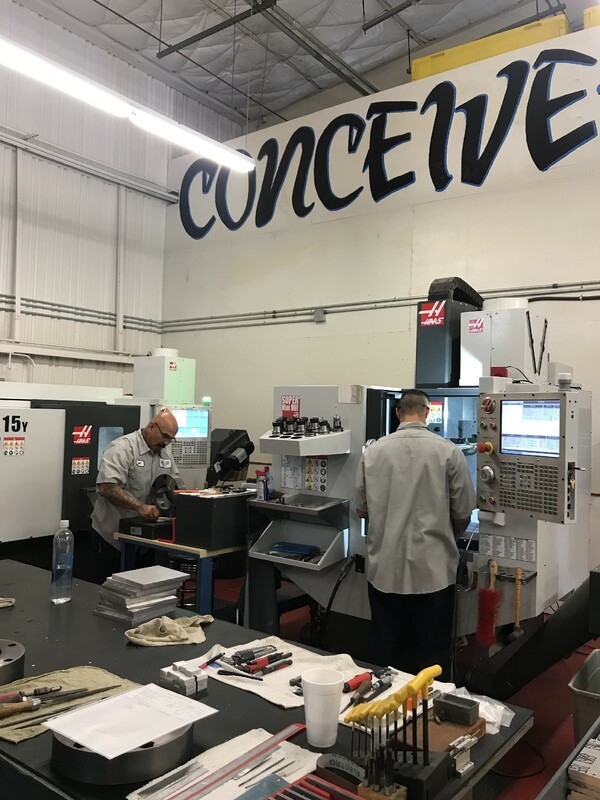 Our machine shop is equipped with four Haas CNC mills and a Haas CNC lathe. We train our members on contract work under the close supervision of our professional staff. Our Machine Shop is helping to fill a need for quality machining work for our local customers. In addition to meeting these local machining needs, our program is helping to address the severe shortage of trained machine operators. The demand for a machinist is great and that demand is growing as machinists from the baby-boomer generation are retiring. Our Machine Shop prepares our members for successful reentry into society with a well-paying career. Fully employed, responsible, tax-paying citizens will help to reduce the rate of recidivism, lower the costs of incarceration and increase the safety of our communities. 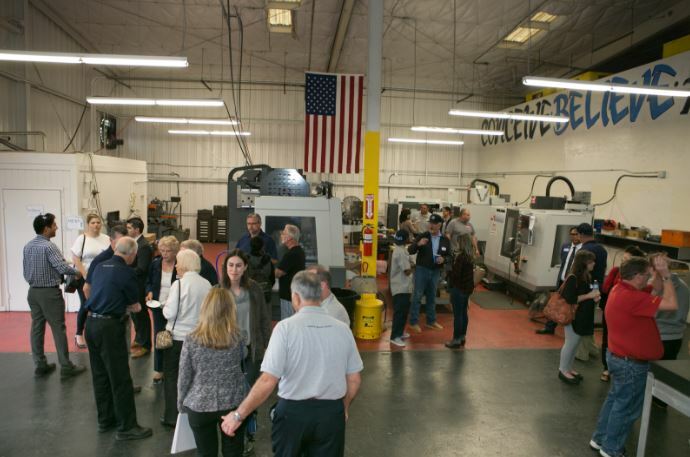 Finally, revenue from our Machine Shop Social Enterprise assists in meeting the operational expenses of a nonprofit that is working to address a critical issue and to increase the safety of our neighborhoods. We opened our machine shop in Feb 2016 and began training our first member in mid-March. Due to the early success of our social enterprise, we launched our 15-month Machine Shop Social Enterprise Expansion Project in October 2016. The goal of the project was to increase our training capacity so that we can train twelve members at a time, graduating two every quarter and enrolling two new members every quarter. The expansion project was completed in October 2017, three months ahead of schedule thanks to our generous donors and grantors. 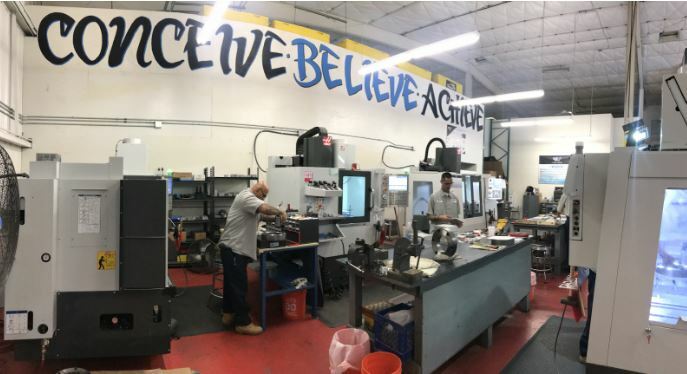 The project took us from a 500 sf facility with one CNC machine to a 4,000 sf facility with five CNC machines and the capacity to employ/train 12 members. This year our focus is on developing our quality control program and increasing our customer base so as to receive more contract work for training our members. In preparation for our future prevention program, we have created our private labeled coffee and also provide silk screening and embroidery services. Our intent is to build our customer base so that we can open additional social enterprises and have employment opportunities for those who will be served in our prevention program. San Diego is a great place for our nonprofit. As mentioned earlier, we have a street gang issue that needs to be addressed. Our community has been supportive of our efforts in terms of grants, donations and volunteers. Our city also has a demand for machining work and a need for trained CNC operators. This demand supports our Machine Shop Social Enterprise and will provide employment opportunities for our graduates.